Whatever happened to the people who played Darth Maul, Jar Jar Binks, Obi-Wan Kenobi, and more. Since the first batch of text crawled across the screen in A New Hope, appearing in a Star Wars movie has served as a launching pad. From acting veterans such as Billy Dee Williams to newcomers like Daisy Ridley, it’s placed actors’ careers in hyperdrive — though not each of those actors have been able to take advantage of it. As the third generation of Star Wars actors begin to find new acting roles, let’s take a look at the first post-Star Wars roles of some of the saga’s lead actors. Ridley was plucked from relative obscurity to become what we think is probably the best part of the newly kickstarted Star Wars saga. Casting her as Rey was a big gamble for J.J. Abrams, but she pulled off being the lead in The Force Awakens like a pro. For her next role, she’s sticking close to her first big-screen collaborators. Besides jumping into Rey’s wardrobe again to film Star Wars: Episode: VIII, Ridley is set to appear in the fantasy thriller Kolma, which sees her re-team with her Force Awakens director, Abrams, who will produce the film for director Marielle Heller (Diary of a Teenage Girl). Ridley is supposed to play the lead who dies in a car accident and gets the chance to relive it again to reunite with her lost love. The man formerly known as FN-2187 was previously known for a starmaking performance in the alien invasion action comedy Attack the Block. Boyega’s next role will be in director James Ponsoldt’s adaptation of author Dave Eggers’ social media satire The Circle. He’ll appear as actress Emma Watson’s love interest at a Facebook-esque social media empire alongside co-star Tom Hanks. Not too shabby for a former stormtrooper. The film doesn’t have a release date as of yet. The most charming dude in the galaxy will return this summer as the most devious mutant in the universe. Isaac will play the titular villain Apocalypse in the next X-Men movie, set for release on May 27. 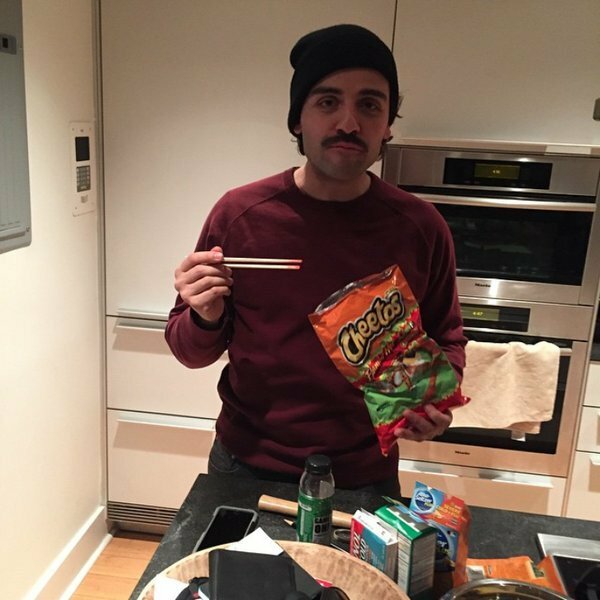 Sure the character kind of resembles the purple bad guy from the original Power Rangers movie, but Isaac is the type of guy that can make any goofy role look awesome: even when he’s eating Cheetos with chopsticks. Like Isaac, Adam Driver doesn’t let one of the highest grossing movies ever made stop him. Besides appearing in Lena Dunham’s HBO show Girls, Driver has already seen the release of his Force Awakens follow up as a government intelligence agent in writer/director Jeff Nichols’ sci-fi drama Midnight Special. While Driver isn’t the best part in that movie (ahem, Michael Shannon, ahem), he still gives the Spielbergian tale the gravitas it needs to make the pseudo-science mumbo jumbo land and the weight of the drama resonate. He didn’t even have to do it from behind a mask this time. After that, Driver has Martin Scorsese’s religious drama Silence and Jim Jarmusch’s lovable loser tale Paterson up next. Like Ridley, Mark Hamill became the face of Star Wars in his first feature film role after appearing in a handful of episode of television shows. It might seem that Hamill was hampered by Luke Skywalker, the farm boy that brought balance to the galaxy in the saga, but he carved out a niche career in genre films like Village of the Damned and a celebrated voice role as the Joker in many iterations of the animated Batman TV shows and movie. His first post-Star Wars role was as Kenny, a California teen that sets out to find his stolen custom Corvette Stingray in Corvette Summer, directed by George Lucas collaborator Matthew Robbins. Fisher had a lot to live up to on-screen. Her parents were Hollywood royalty: her mother was actress Debbie Reynolds and her dad was singer Eddie Fisher. Technically her next film after Star Wars was its sequel, The Empire Strikes Back, but she turned up as the anarchic Mystery Woman in John Landis’ musical comedy classic The Blues Brothers because she was dating actor Dan Aykroyd at the time. If you don’t remember, she’s the woman who tries to blow up the flophouse where Elwood Blues lives with a bazooka and then a bomb. After a handful of small TV roles and uncredited parts in movies, Harrison Ford stumbled into the role of a lifetime as Han Solo in Star Wars. He mostly got cast because he appeared in George Lucas’ previous film, American Graffiti. But the same year Star Wars was released, Ford appeared in the anti-Vietnam War comedy-drama Heroes as a veteran that helps a former soldier and mental patient played by Henry Winkler escape to California to start a worm farm. The film, co-starring Sally Field, was actually filmed before Ford jumped into the pilot’s seat of the Millennium Falcon in Star Wars. The coolest and sneakiest dude in the galaxy had a long history on stage and screen before he became Lando Calirissian in The Empire Strikes Back. Billie Dee Williams hit Broadway at the tender age of 8 in a play called The Firebrand of Florence and broke out way later as Gale Sayers, the football friend of James Caan’s Brian Piccolo in the 1971 tough-guy TV movie weepie Brian’s Song. But after he double crossed his friend Han Solo and then double crossed Darth Vader in Empire, Williams appeared as the hardened police detective partner of a post-Rocky Sylvester Stallone in the 1981 action movie Nighthawks. The movie is perhaps best known for its troubled production, which saw the film taken away from its director and re-edited by its distributor, Universal. There are Star Wars success stories, and then there is Jake Lloyd, the child that had the gift and burden of appearing in The Phantom Menace as the exceedingly annoying little version of Anakin Skywalker. What started as a promising child actor career in goofy movies like Jingle All the Way, and seemed to skyrocket with Star Wars ended abruptly; Lloyd’s first post-Star Wars role is also currently his last. It wasn’t all that notable, either, as played the son of a hydroplane racer in the 1970s-set 2005 family film Madison. Since then he’s mostly made headlines for running afoul of the law, including when he was arrested last year for leading South Carolina police on a high speed chase. Natalie Portman on the other hand, is doing just fine, thank you very much. The child actor, who starred in movies like Leon: The Professional, grew up during the Star Wars prequel trilogy, and eventually won the Academy Award for Best Actress for her creepy-as-hell portrayal of a ballet dancer plié-ing on the edge of sanity in Black Swan. After her first appearance as Padme Amidala in The Phantom Menace, she played Susan Sarandon’s daughter who moves to Beverly Hills from rural Wisconsin in the feel-good mom drama Anywhere but Here. McGregor was the best part of the Star Wars prequels, as he made the best out of the trash he was given. Before he threw on the robes as would-be master Jedi Obi-Wan Kenobi, he was best known as the heroin-addicted lead character in director Danny Boyle’s batshit adaptation of Irvin Welsh’s infamous novel Trainspotting. McGregor has range, and he stretched that range as a hard partying financier in a movie called Rogue Banker. Think of it like a British, post-Boiler Room, pre-Wolf of Wall Street story of ridiculous greed. Two Anakins, two moribund film careers. Christensen is a fairly good actor even though there’s his performance in the Star Wars prequels didn’t do much to prove it. But his first role after Attack of the Clones does show off his range. In Shattered Glass, Christensen plays disgraced journalist Stephen Glass, who invented quotes, sources, and entire events in a series of articles for The New Republic in the late 1990s. Unfortunately the movie quickly faded from theaters, as did Christensen, who’s still clinging to roles in movies like the Christian drama 90 Minutes in Heaven. Ahmed Best - Kangaroo Jack: G’Day U.S.A.! The guy who plays Darth Maul is the most badass dude who ever lived. Ray Park made a career out of doing badass stunt work, and has used his experience in martial arts to appear in movies like Bryan Singer’s original X-Men movie as Toad and in the G.I. Joe movies as Snake-Eyes. What did he do after getting chopped in half in The Phantom Menace? He played a dude who was chopped into three-fourths as the headless horseman in director Tim Burton’s Sleepy Hollow.